Lift the spirits of everyone you encounter when you're wearing the irresistibly cheerful scent of Miss Dior Absolutely Blooming. This exuberant fragrance from the iconic design house of Christian Dior launched in 2016 to serve as the perfect complement for today's life-loving woman. Bright opening notes of red raspberry and tangy pomegranate flow into a luscious heart of May rose and peony that add a touch of softness to the blend. White musk on the base lends depth and smoothness, inspiring many happy smiles. 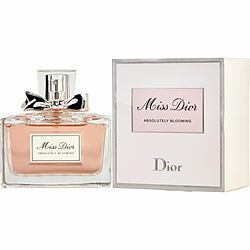 Miss Dior Absolutely blooming is now my #1 favorite! It lasts all day and I get compliments on it everywhere I go! I purchase the mini vile just test it out and fell in love with it! I will be purchasing a full size bottle for myself and as a gift for a friend as well! Love it! I smelled a sample of this fragrance and loved it. I purchased it because it has a richness and fullness about it. You can smell the layers of notes that come together for a sweet and spicy collaboration. It's more of a winter fragrance for me but I am looking forward to wearing it. It's nice! Miss Dior Absolutely Blooming has a very nice fragrance. It is not too sweet or spicy. Very good.